If you want to skip the download and play skyblock with other people, feel free to check out the official skyblock server! 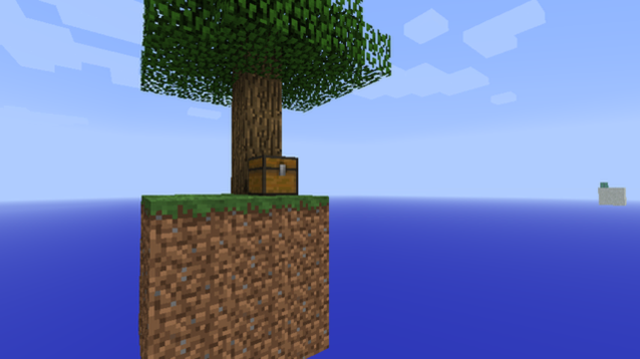 As of Minecraft 1.3.1, spawning on Skyblock after dying is nearly impossible. It is recommended that you should either sleep in your bed, so when you die you spawn next to it, or download a fix made by King Korihor. If you would like to download the fix and read a more thorough explanation on why, Please click http://www.minecraft.../#entry17458006 and hopefully this issue will be solved in a later update. Lava + Water = Cobblestone. Feel free to post pictures of your achievements and progress! Downloads not available for this map, the only way to play this is to play it on the server due to it having custom coded features. 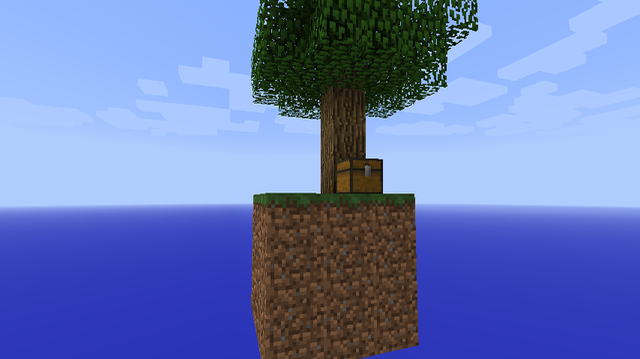 Skyblock version 1.1/2.1 are both different, 1.1 is not outdated. Want more of a challenge? Play 1.0/2.0 for a smaller island. As requested, the first versions of SkyBlock! Do NOT leave the island. NO Mods, Hacks, Flying, etc. Post pictures of your achievements and progress! 1.Build a Cobble stone generator. 12.Make a small waterfall and a lake. 14.Make a infinite water source. 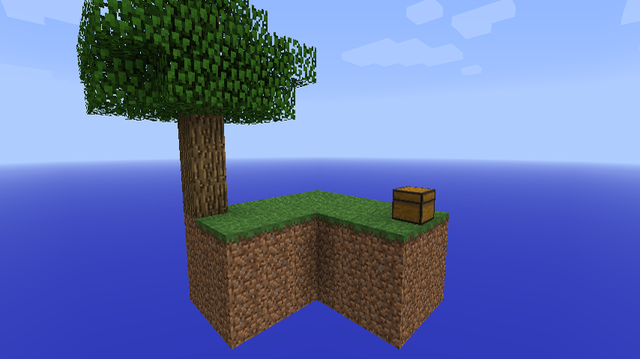 Make an area for mobs to spawn at-least 24 blocks away from the island. Thank you TheJupiterSailfish for the first series ever of SkyBlock! Check out his channel for part 2,3, etc. Place what version you downloaded in the saves folder, to reach your saves folder follow the instructions below. Are you having issue's downloading the map? You might click download in mediafire and it will just refresh the page, and not let you download or just show the ?processing download request? instead of providing an option to download. This occurs because mediafire is prohibiting some countries from downloading at a certain time. You can easily solve this by deleting your browser cookies. If you are using other browsers, just find a way to eat the cookies. If for some reason you are tired of your water turning into ice and don't know how to place a torch next to your water source, you can switch the snow biome to a non snow biome. Download the level.dat that corresponds with the version of SkyBlock you are playing, and replace it. Note: You will have to skip challenge #32. Make sure you replace the level.dat before you start the map, or place everything that is in your inventory in a chest. If you do not do so, your items in your inventory will be gone. Read the title of each spoiler. View the contents of a spoiler to answer your questions. Not everything will be here, as this map is meant to be a challenge, so not everything can be answered. "How do I keep my water from re-freezing?" This is a very simple fix. To stop your water from re-freezing, as this is in a Tundra (snow) biome, simply place a block above your water source, or a torch next to the source. There are alternative downloads for the level.dat file, but this will eliminate a challenge and therefore you can't complete them all. Note: This will take out challenge #32, (32) Craft 10 Snow Golems.) If you have any problems, check in with Noobcrew. "How do I light a Nether portal without Flint & Steel?" This is very simple to do, but it may take a few tries. The basic idea is to get your lava to light a piece of wood or something else flammable, and have the fire spread through the portal frame so it ignites, therefore activating it. Both planks should be burning..
TL;DR - Set up portal, put wood at base and back of portal, light wood at base, let it spread to back, BAM portal lit. "How can I make an infinite water source with only one ice block?" You can't. The solution is to go to the Nether, using the guide(s) above - once you're there you will find a chest with the second ice block, and many more necessary items to finish all of the SkyBlock challenges. (Items included in the Nether are 27 blocks of glowstone, brown and red mushrooms, the chest, second ice block, sugar cane, and birch sapling). "My Sand island fell ... can you put a layer of sandstone on the bottom?" This is a very easy fix as well. 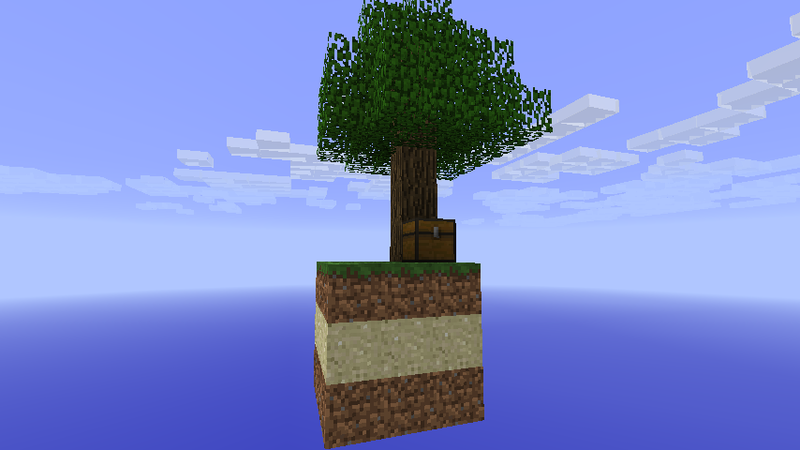 If you want to be able to collect of your sand (to finish challenges), build down below the layer of the spawn island with the bedrock by 2 levels. You can do this by using "water scaffolding" (If you don't know what this is, YouTube or Google it) then build over to the sand island. Once your over there, build a 3x3 or larger platform directly under the sand, and it will all fall down onto your platform where you can safely collect it. Note: Be careful while using water scaffolding! Make sure the water can't form back into ice or you will fall into the void! Also, make sure you collect the cactus block on the sand island, or it may fall into the void when the sand falls. "Can you fix the snow biome please?" It's actually not broken, it's meant to be in one to replace it, read the spoiler above - "How do I keep my water from re-freezing?" "Can you reduce the amount of wool for the tasks?" There are easy ways to get all of the wool you need, and more! You can create a spawner designed just for spiders to get plenty of string. "How do I get gold ingots?" Go to the Nether (with guide above) and make a platform there for zombie pigmen to spawn on. Kill them for gold nuggets. Once you have 9 gold nuggets, place them in a crafting table in a 3x3 fashion, which creates one gold ingot. Holy crap... now THATS a survival map. Wow, this is quite the map. It's so simple yet quite the ingenious idea. 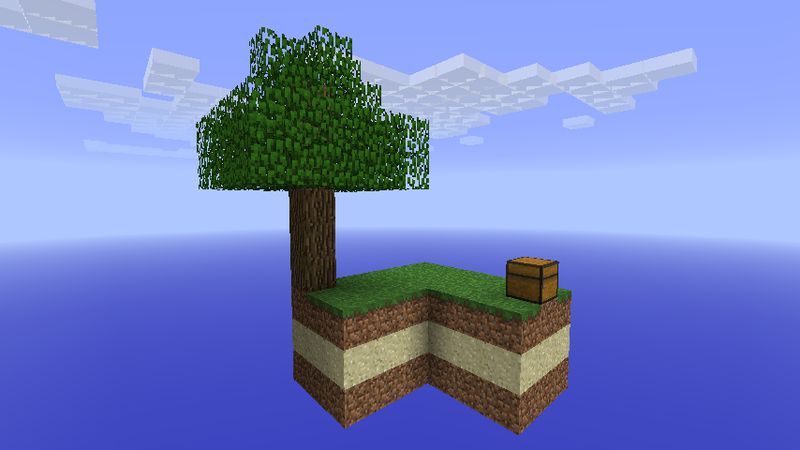 Notch should design the game so that every once in a while, the game rejects your seed and spawns you in something like this. OT: I actually like this quite a bit. I desperately need more dirt and sand though. It's kinda difficult to make a forest, a wheat farm, and a reed farm with only 9 pieces of dirt (8 for me since 1 fell into the void). Would it be possible to add a way to get more dirt? And possibly more sand? Btw: The feathers are useless without a way to get flint. Yeh, any ideas on how I can add more dirt and sand? Cobble stone/stone you can make with water and lava. and such should I just add sand and dirt to the chest? Maybe 1-4 blocks of dirt in the chest would be nice. Any more and they would be used mostly as platform blocks. It is posssible to complete all of the challenges with the provided blocks. Just some of them not very well. Amazing work you did here. This signature is under construction. Expected completion time: December 22nd, 2012, when the world hasn't ended(So it can mock those who thought the world was going to end). 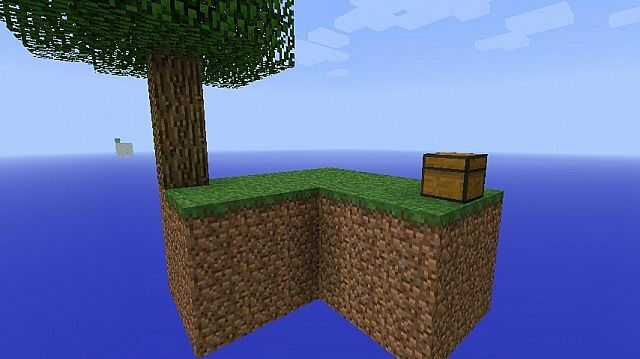 Everyone reading this topic has to try this map.. you wouldn't believe how much fun it is making a cobblestone generator on a precarious little platform of dirt! Very fun map for something so simple. It also made me realize how quickly you can multiply the blocks that you have. The only real problem was that you had a limited amount of sand, dirt and ores. My suggestion would be to put more different blocks into the platform. Or maybe another island to get to? The only real problem was that you had a limited amount of sand, dirt and ores. My suggestion would be to put ... another island to get to? Nice. You should add this to your website. In 1.1 I added some more dirt and sand. Version 1.1 was a lot of fun. It was a challenge getting the dirt out from the bottom to make a generator. Here's a picture of my beautiful sky island. This is the download for my map for those who want to explore. Overall, I'd have to give this map 10/10. Downloading right now.. this is awesome! If I helped you in any way, think about leaving a +1. Thanks! AWESOME, This is exactly how I imagined what other people would create. lol the first thing I thought when I saw this map was HOLY ****! How has no one thought of this before? !